The babelConnect app allows you to handle calls in any view and on any page. But it is not just a phone app. You also get detailed control of call recording. This allows you to do almost anything with recordings: ensure compliance with both consumer data protection, PCI requirements and any industry specific needs around recordings. On top of that, you can tag recordings, flag them for assessment and create automations that run in the background to make sure the recording is associated with the right data. babelConnect also gives you the ability to send SMS directly to contacts. 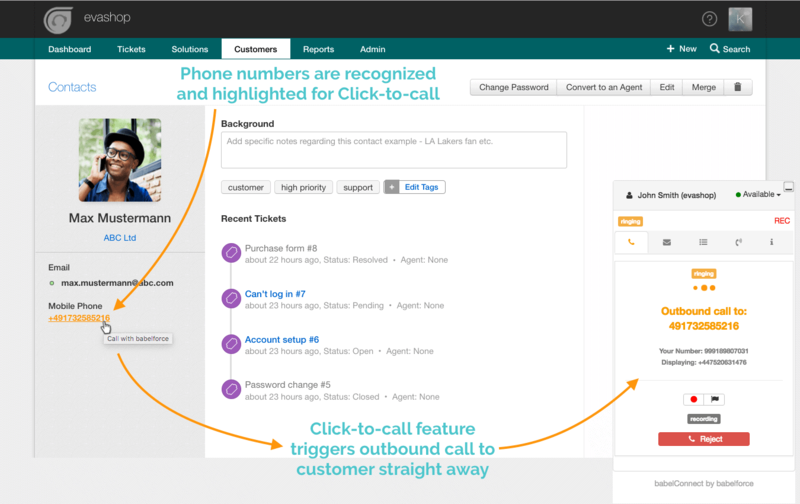 babelforce automatically adds deep outbound call functionality wherever you view contacts you want to phone. One click will not only start the call, but will also give your employees the right control of recording. You can set this up whatever way you need to for your business processes. 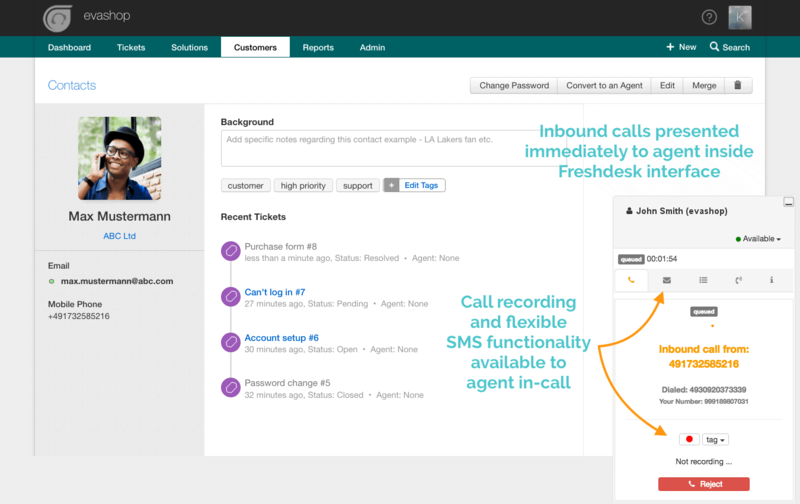 Where it gets really clever is if you combine this functionality with actions on the Freshdesk API: then you can add the data you want to tickets based on the outcome of the outbound call. This can save a fortune in time and makes lots of processes easier. Why do anything by hand if you can automate it? We encourage you to come up with every use case where you would ideally add some intelligent automation. With the babelforce actions for Freshdesk API, you can be confident that you can create almost any kind of funky automation. 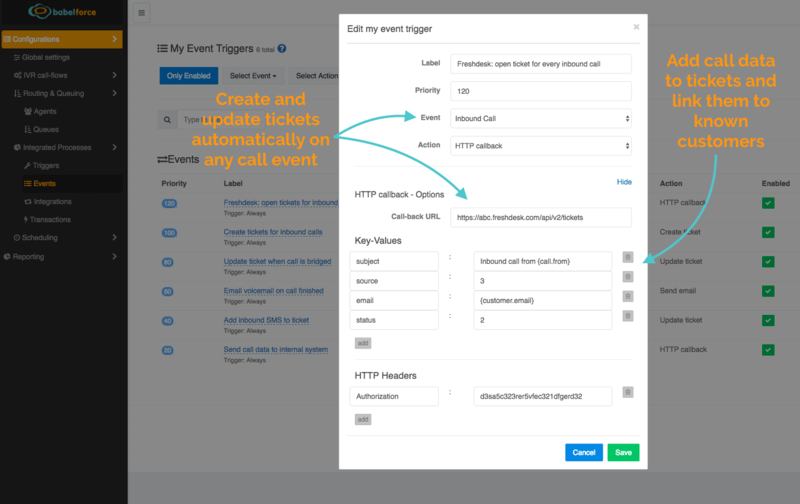 You can send data gathered in IVR to a ticket, you can add info from inbound and outbound SMS to tickets, you can make the right voicemails available in the right tickets. You can automatically select samples to receive post call surveys and the surveys can do the research work for you. A call is a real-time interaction. Your agent activity and availability is also changing all the time and impacting your ability to handle calls as well as other processes. So monitoring calls, queues, agents in real-time is vital. Being able to put real-time data points in context with calls from day so far is also important. 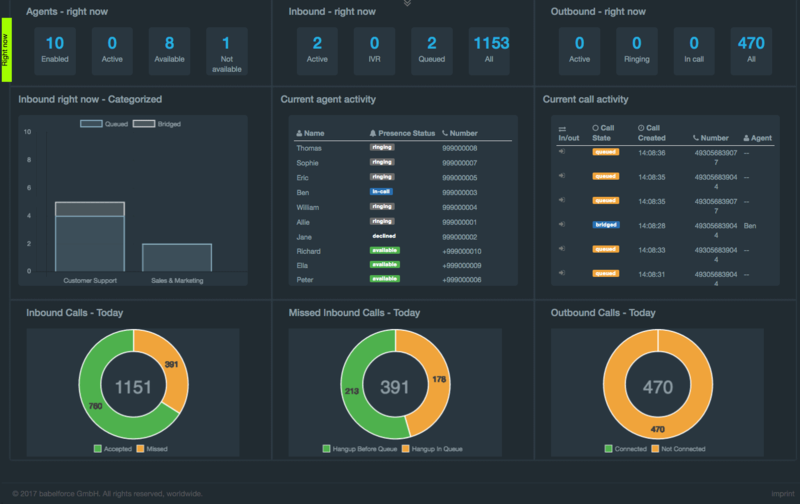 babelforce dashboards for your Freshdesk calls gives you the ability to get this monitoring out-of-the-box and in a format that is ready to put on big screens on your walls. Request a demo and we will help you to build the most complex of integrated processes in Freshdesk.